and stiffness of the front chassis area and factory K-member. This additional stiffness helps to maintain correct front suspension geometry while under load by minimizing flexing. The result is tighter steering response and more predictable handling under cornering and braking. *May have clearance issues with some 7qt oil pans. - Manufactured of 1 x .083 tubing to maximize stiffness and strength while reducing weight. - Design optimized using CAD/CAE software combined with real-world test data. 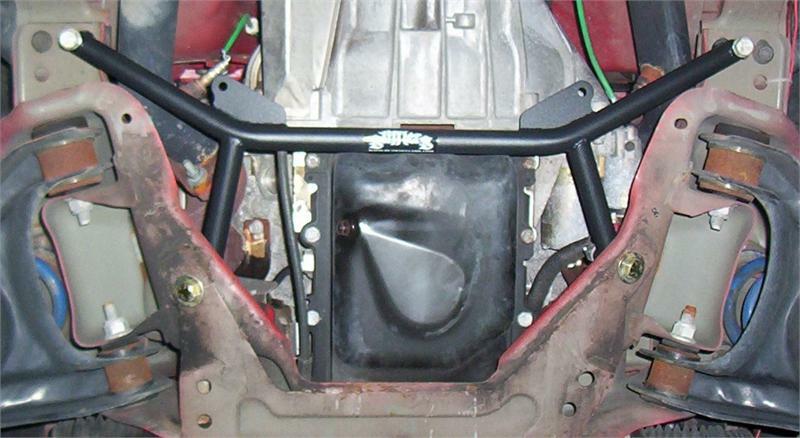 - Industrial grade powder coat for long life, to outlast the vehicle. rear chassis sections for unprecedented car control! NOTE: Will not work with long-tube headers.